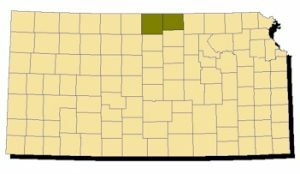 Range: Only known from two counties in north central Kansas. Description: Harmless. Named for its body color and the smooth scales covering its body. A bright green serpent with a white or cream-colored belly. 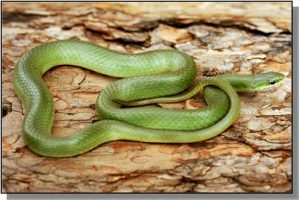 It differs from the Rough Green Snake by having smooth scales, a stouter body and its habitat preference: it is a ground dweller. The young are miniature adults. Habits: Active during the day from April to early October. Always found on the ground; prefers cover along the edges of streams, but also sometimes found in wet meadows and on open brushy ridges. An egg-layer. Breeding occurs in spring or autumn; the eggs are laid in June or July. Specializes in feeding on insects and other invertebrates. A harmless serpent that never bites.